There is no one, however wicked, whom Mary does not save by her intercession when she wishes ... He who has recourse to Mary shall be saved. No one, not even a sinner, who devoutly recommends himself to her shall ever become the prey of Hell. However great a sinner may have been, if he shows himself devout to Mary he will never perish. Mary was made Mother of God to obtain salvation for many who, on account of their wicked lives, could not be saved according to the rigor of Divine justice, but might be saved with the help of her sweet mercy and powerful intercession. The Saints assert that anyone who prays to the Mother of God in time of temptation will be preserved from sin, and that whoever approaches her with perfect trust throughout his life will surely be saved. My children, if you desire perseverance, be devout to our Blessed Lady. Mary obtains salvation for all who have recourse to her. Oh! If all sinners had recourse to Mary, who would ever be lost? ... He who is protected by her will be saved; he who is not will be lost. It is impossible to be saved without the help of the Most Blessed Virgin, because those who are not saved by the justice of God are saved by the intercession of Mary. We believe that Mary opens the abyss of God's mercy to whomsoever she wills, when she wills, and as she wills; so that there is no sinner however great who is lost if Mary protects him. Hell is not the lot of any true client of Mary for whom she prays even once, and for whom she says to her Son that she wishes him to be saved ... It is sufficient that you desire our salvation, O Mary, and we cannot help but be saved. Not one of those who love her can perish; not one of those who try to imitate her can fail to attain eternal salvation. Not a single soul who has really persevered in her service has ever been damned. No one who shall invoke this Mother of Grace with devotion and perseverance can possibly perish forever. By Mary, God descended from Heaven into the world, so that by her men might ascend from earth into Heaven. The sign of those who will be saved consists in this: that they have a great devotion to Mary in their hearts. I believe that devotion to thee, O Lady, is a certain sign of eternal salvation. Devotion to Mary is a sure sign of predestination to him who possesses it. Mary is the Mysterious Book of Predestination to glory. Love of Mary and devotion to her are a sure sign of obtaining eternal salvation. O Mother of Perpetual Help, confidence in thee is a certain pledge of everlasting salvation. O Mother of God! If I place my confidence in thee, I shall be saved; if I am under thy protection, I have nothing to fear; for the fact of being thy client is a possession of a certainty of salvation which God grants only to those whom He intends to save. O Most Blessed Virgin, just as everyone who hates thee and is forgotten by thee must necessarily perish, so also must everyone who loves thee and is loved by thee necessarily be saved! O how long ago the earth would have been destroyed, if Mary had not interposed! Hail, Mary, gracious Mother of Mercy; who would not love thee? Thou are out certain salvation! She is the eldest daughter of the Great King. If you enjoy her favor, she will introduce you to the Monarch of the Universe. No one has so great an interest with Him than Mary, who was the occasion of His coming down from Heaven to become man for the redemtion of mankind. If you wish to walk securely and be certain of your salvation, if you aspire to a great crown in Heaven that will never fade, love and honor Mary, and strive to make her known, loved, and honored by others. Just as it is impossible for one who is not devout to Mary, and consequently not protected by her, to be saved, so is it impossible for one who recommends himself to her, and consequently is beloved by her, to be lost. No, he can never be lost who recommends himself to thee, O Mary. If she protects you, you have nothing to fear, for you cannot be lost. A true servant of Mary cannot be lost. Being thy servant, O Mary, is a surety of salvation God grants solely to those He will save. Whoever bears the mark of a servant of Mary is already enrolled in the Book of Life. To serve Mary is a mark of eternal salvation to come. As many serve the Virgin as serve God. Happy are the faithful slaves of the Queen of Heaven, for they shall enjoy true liberty! To serve Mary and to be her courtier is the greatest honor we can possibly possess; for to serve the Queen of Heaven is already to reign there; and to live under her command is more than to govern. Every Saint belongs to the court of the Queen of All Saints. The servants of Mary are as sure of getting to Paradise as though they were already there. Who are they who are saved and who reign in Heaven? Surely those for whom the Queen of Mercy intercedes ... The clients of Mary will necessarily be saved. Angels constantly guard the clients of this Blessed Virgin from the assaults of Hell. The future will be resplendent, and an untold number of souls will be saved, but on one condition: that your sons be devoted to the Blessed Virgin. O Mary, you give assistance to everyone endeavoring to rise to God! If you are in danger, if your hearts are confused, turn to Mary; she is our comfort, our help; turn towards her and you will be saved. Who, O Lady, ever faithfully employed your all-powerful aid and was abandoned by you? O Blessed Mary, whoever loves you honors God; whoever serves you pleases God; whoever invokes your holy name with a pure heart will infallibly receive the object of his petition. 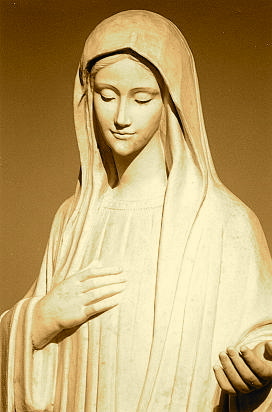 I therefore command all my Brothers, those living now and those to come in the future, to venerate the Holy Mother of God, whom we always implore to be our Protectress, to praise her at all times, in all circumstances of life, with all the means in their power and with the greatest devotion and submission. O admirable Mother of God! How many sins have I committed for which thou hast obtained pardon for me, and how many others would I have committed if thou hadst not preserved me? How often have I seen myself on the brink of Hell in obvious danger of falling into it but for thy most benign hand which saved me? How often would the Roaring Lion of Hell have devoured and swallowed up my soul had not the charity of thy heart opposed him? Alas! Without thee, my dearest and my all-good Mother, where should I be today? I should be in the fiery furnace of Hell from which I would never emerge! Do you want certain salvation? Then have great devotion to the Virgin Mary... She will guarantee your salvation. She infallibly saves the one who honors her. Most amiable Queen, I, a miserable sinner, also love thee, but I love thee too little. I desire to obtain a greater and more tender love for thee. Obtain this for me; because to love thee is a great sign of predestination and a grace which God does not grant except to those whom He will save ... If thou dost not assist me, I shall be lost. No. No one can be lost who recommends himself to thee. In thy hands, therefore, do I place my eternal salvation and to thee do I consign my soul, which was lost, but which thou wilt save by thy holy intercession.